Observe New York City bodega cats in their natural environment in this faux nature documentary. Enjoy this shot of a NYC bodega cat chillin from the heat. Working cats have got to take a break sometime! 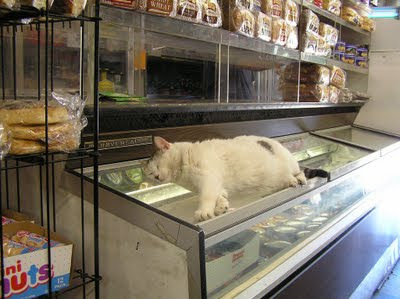 To see more bodega cats keeping cool, go to Buzzflash. That was a great video, and they found some cool boxes in that place!